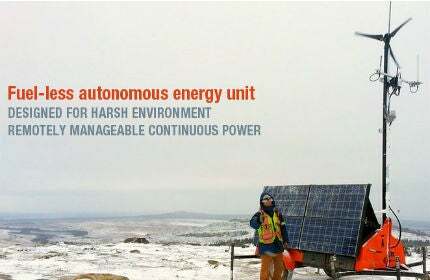 LYKO Systems designs and distributes autonomous energy units. These solar and wind powered systems are primarily used by the mining industry to power repeater radio systems. The robustness and reliability of LYKO systems allow for deployment in the most remote locations where climate and terrain are challenging. With automation and computer use growing more common in the mining business, the amount of information that has to be carried between the mobile equipment and the fixed installation is rapidly increasing. Telecom manufacturers are tackling this challenge by developing high bandwidth radio systems that can be quickly deployed in the field. But all this equipment needs to be powered – and this can prove difficult in mining conditions. The ever-changing nature of mine layouts often makes it impossible to install permanent structures and the mobile solutions offered on the market are not likely to survive the hostile mining terrain and climate. Based on a list of specific criteria expressed by the mining industry, LYKO engineers developed the AMU-900 energy unit. The AMU-900 has been successfully deployed in several mining sites in northern Canada, where temperatures often reach -40°C. LYKO products are designed to work in an autonomous fashion for several months. Most system parameters can be remotely controlled and monitored, which further reduces the maintenance requirements of the unit. Most LYKO units are deployed in remote locations where maintenance visits are expensive – or simply not possible during some periods of the year. With LYKO units, all health parameters can be remotely monitored, and e-mail alerts can also be set in order to prevent downtime and ensure the load is safely powered, 24/7 – all year long. To ensure all units are properly sized, LYKO’s engineers have developed a script that analyses environmental data and can accurately predict whether or not a certain configuration could power a determined load in a specific geographic location. The GPS coordinates, solar array size, and the battery bank dimensions are supplied as the input to the software, and the output graph shows the battery level during every season of the year. Every customer can therefore be assured that the units they deploy will perform as they expect. Download the free flyer to read more about the battery and solar-powered energy unit for adverse environments.